A new trend in the jewelry industry is helping men and women move forward in the aftermath of divorce. Oftentimes women finalize their divorce and are unsure of what to do with the expensive ring they’ve been wearing for all those years. The ring itself may have greater symbolism to the wearer than just the marriage, so giving it up can be difficult. That’s why jewelers in the Baltimore and Washington, D.C.area have begun offering redesign services for your wedding jewelry. Perhaps you’re celebrating your divorce but you aren’t ready to give up the diamonds. Consider having the stones removed from the old ring and re-purpose them in a new divorce ring that symbolizes your new life. Divorce rings tend to have a more whimsical look and are slightly less elaborate than a wedding ring. Some people have found that instead of putting the old stones into a new ring, it is possible to take the stones and add them to a custom pendant, earrings, or other jewelry piece. Since the diamond ring has long been representative of marriage, this allows to you signal that you’re available but hang on to the precious stones. A somewhat unusual trend that’s gaining steam is using the old ring to get remarried. 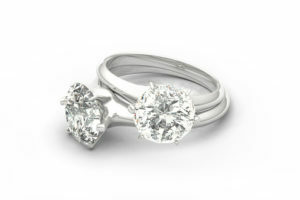 Oftentimes this involves removing the stones and placing them in a new setting so the ring won’t be exactly the same. Among those who go this route, women tend to give the old ring to their new beau and have him create a custom wedding ring or custom wedding band to propose with. This method ensures that there is still an element of surprise in the mix. If you’re considering redesigning your old wedding ring into something representative of your new life post-divorce, contact Dominion Jewelers to learn more about custom ring design services. Winning the diamonds gives you the opportunity to turn them into something you will love for the rest of your life. Men and women throughout Baltimore and Washington, D.C., have already begun enjoying their creative new designs from Dominion Jewelers! ← Should I Go With the Latest Jewelry Designs, or Stick with the Classics?